← Looking for a visual Math GenEd? Are you freaking out about graduating this year? Posted on January 4, 2019 by Kari Scott| Comments Off on Are you freaking out about graduating this year? Are you unsure of what to do after graduating this year? Are you starting to freak out because you don’t know even how to start looking for a job? Do you want to set up a studio but don’t know what you don’t know about doing that? Well, we have the solution. 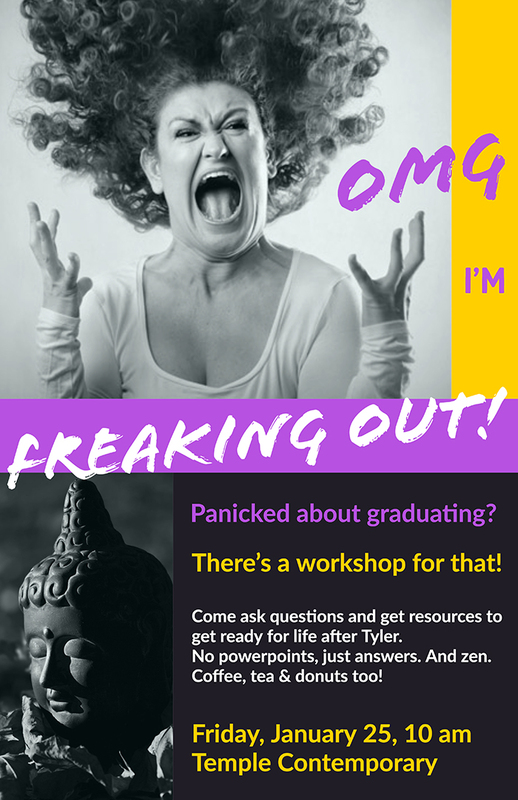 This will be a mini-workshop, resource session and Q&A for students who are getting ready to graduate and need help to figure out how to get ready. No powerpoints–just answers, help, resources, and love, along with coffee, tea & donuts. Friday, January 25, 10 am, Temple Contemporary.